Combined with potent antioxidants, CLINICAL 1% Retinol Treatment is specially formulated to smooth and firm skin by helping to boost healthy cell regeneration and stimulate collagen production. Its light, silky texture absorbs quickly and goes to work immediately to refine pore size as it reduces deep wrinkles, fine lines, and brown spots. Also excellent for reducing breakouts. Licorice, oat extract and other anti-irritants help to minimize the irritation some people may experience from products containing high amounts of retinol. You’ll be amazed at how much younger and radiant your skin will look and feel. A consumer panel test showed that 92% of users preferred this retinol product over other, similar products they’ve used. When first using, apply no more than three times per week, at night. Increase frequency to every other night and, finally, every evening as tolerated. Regardless of how often it is used, apply a pea-sized amount after cleansing and toning. Avoid the lips, direct contact with the eye, and corners of the eyes. You may apply up to the orbital bone of the eye area. For best results and to reduce the risk of irritation, it is best when used with our cleanser, toner, serum, and daytime and nighttime moisturizers. 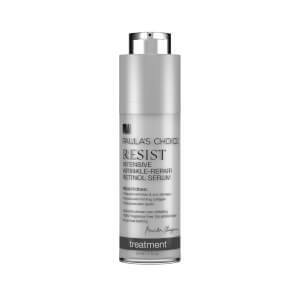 If irritation occurs, reduce frequency of use or mix one pump of this retinol treatment with your favorite Paula’s Choice serum or moisturizer. If irritation persists, discontinue use. Protect skin daily with sunscreen rated SPF 25 or greater, or layer sunscreens (moisturizer, foundation with sunscreen, and pressed powder with sunscreen) if they are all rated SPF 15 or greater (and greater is better). May be applied at the same time as your AHA or BHA exfoliant, but pay attention to how your skin responds. If you notice signs of irritation, apply your exfoliant in the morning and this treatment at night or reduce frequency of application of this retinol treatment. Can be worn under or over moisturizer. 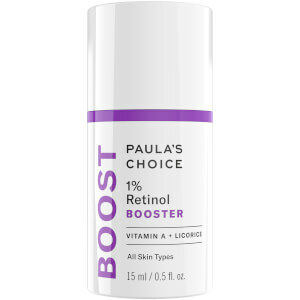 May be combined with any prescription retinoid product, including Renova, Retin-A, Refissa, Differin, Tazorac, or Avita. Discontinue or reduce frequency of use if irritation develops or persists. Water, Dimethicone, Glycerin, Butylene Glycol, Isononyl Isononanoate, Castor Isostearate Succinate , Glyceryl Stearate, C12-15 Alkyl Benzoate (thickener), Dimethicone Crosspolymer, PEG-33, Polysorbate 20, Behenyl Alcohol, Retinol, Tetrahexyldecyl Ascorbate, Ceramide 2, Palmitoyl Tetrapeptide-7, Palmitoyl Hexapeptide-12, Sodium Hyaluronate, Dipotassium Glycyrrhizate, Glycyrrhiza Glabra (Licorice) Root Extract, Avena Sativa (Oat) Kernel Extract, Arctium Lappa (Burdock) Root Extract, Salix Alba (Willow) Bark Extract, Glycine Soja (Soybean) Sterols, Lecithin, Allantoin, Tocopheryl Acetate, Hydrolyzed Soy Protein, Sorbitan Laurate, Acetyl Dipeptide-1 Cetyl Ester, Disodium EDTA, Hydroxyethylcellulose, Sodium Hydroxide, Tribehenin, Caprylyl Glycol, Ethylhexylglycerin, Pentylene Glycol, PEG-100 Stearate, PEG-75 Shea Butter Glycerides, PPG-12/SMDI Copolymer, PEG-10 Phytosterol, PEG-8 Dimethicone, PEG-14, Pentaerythrityl Tetraisostearate, Polymethylsilsesquioxane, Magnesium Aluminum Silicate, Arachidyl Glucoside, Sclerotium Gum, Arachidyl Alcohol, Benzoic Acid, Carbomer, Phenoxyethanol. I have used a variety of retinol products and this is quite easily the best. Don't be fooled by products that promise not to make skin sensitive. They don't work. If you use this product every other day, your skin will rapidly get used to it and you can get the full benefit by using daily. Phenomenal results. Clear, smooth skin. 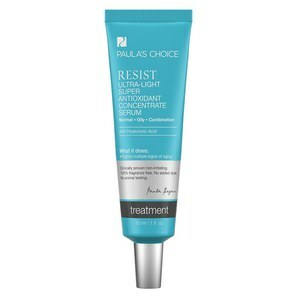 Loving Paula's choice clinical retinol. My skin is brighter and more clear. Also has helped even out discoloration ! I will be purchasing this again and again.